The Liao Dynasty ( ), 907-1125, also known as the Khitan Empire (契丹國, Hanyu Pinyin: Qi4dan1 Guo2), was an empire in East Asia that ruled over the regions of Manchuria, Mongolia , and parts of northern China proper. It was founded by the Yelü clan (耶律 Yēlǜ) of the Khitan people in the same year as Tang Dynasty collapsed (907), even though its first ruler, Yelü Abaoji, did not declare an era name until 916. Although it was originally known as the Empire of the Khitan, the Emperor Yelü Ruan officially adopted the name "Liao" (formally "Great Liao") in 947 (938?). The name "Liao" was dropped in 983, but readopted in 1066. Another name for China in English, Cathay, is derived from the name Khitan. This is also the origin of the Russian word for China, Китай or Kitay, and that of several other East European languages. The Liao Empire was destroyed by the Jurchen of the Jin Dynasty in 1125. However, remnants of its people led by Yelü Dashi established Xi Liao Dynasty 1125-1220, also known as Kara-Khitan Khanate, which survived until the arrival of Genghis Khan's unified Mongolian army. 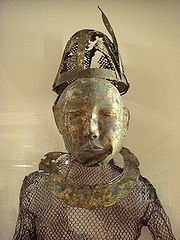 Since not many Khitan records survive, we have to rely primarily upon Chinese records of their early history, which are quite scant prior to the seventh century, though the earliest mention of their existence dates to the fourth century.The Khitan lived on the eastern slopes of the Greater Khingan Mountain range, within the eastern portions of present-day Inner Mongolia. The area is ideal for the raising of cattle and horses, which was the basic source of wealth for the Khitan people. Their culture evolved over the course of centuries, influenced by both conflict and cultural interaction with their neighbors, both nomadic and sedentary. It was also common for Khitan to intermarry with people from neighboring steppe tribes.During the Tang Dynasty in China , it is known that the Khitan were subservient to the Uyghurs who had their capital set in the Mongolian Plateau before their move westward in the 840s. Initial expansion was to the west in the Mongolian plains, filling the power vacuum created by the departure of the Uyghurs. Other steppe peoples residing in the region were the Shiwei, Xi and Tartars. The remaining Uyghurs fled west in the face of the Khitan advance. Over the course of time, the Khitan had made some important observations. They noticed how the Uyghurs had coerced the Tang Dynasty to pay them tribute. They also saw the fearsome effect steppe cavalry used by the Shatuo Turks, the Kyrgyz, and the Uyghurs had against Chinese military forces . Khitan leaders also apparently made the observation that to become sedentary themselves would mean that they would have to compete with the Chinese on their terms , something in which the Khitan would have no hope of success. They knew that they must have access to the resources of China without losing the culture and/or identity that was a critical component of their steppe culture. Liao Dynasty or Khitan Empire, c.
From the 750s, a clan using the surname Yaolian had held the title of khan, holding a monopoly on power for more than one hundred fifty years. They had full relations with the Tang Dynasty court. The first Yaolian khan even had the imperial surname of Li bestowed upon him, though no one in the steppe bothered with it. Yaolian khans wavered from alliance with the Tang Dynasty to joining in with coalitions against it. During this period of time, only the Yaolian clan used a surname among the Khitan. Chinese records refer to eight tribes of Khitan. The most powerful of these tribes was the Yila Tribe. Abaoji was born into this tribe in 872. The Yila Tribe did not use Chinese trappings such as surnames at this time in history, though they did have close relations with China, focusing on their struggle with northeastern jiedushi (military governors) of the Tang Dynasty. Abaoji was elected to be the chieftain of the Yila Tribe in 901. Two years later, he was named “yuyue”, the commander of all Khitan military forces. The Yila Tribe had close relations with the Shatuo Turks. Li Keyong was a partially-sinified Shatuo Turk who was the jiedushi of northern Shanxi . In 905, Abaoji brought a force of 70,000 cavalry to Datong and swore a blood brotherhood with Li Keyong, a relationship that was to shape the region long after both of their deaths. The Khitan chose their Great Khan, or khaghan, at triennial councils. A Yaolian had been chosen at each of these councils since the 750s. However, Abaoji’s successes resulted in his rising status among the Khitan. Seeing him as being worthy, even the Yaolian assented to his election as Great Khan of the Khitan in 907. Abaoji introduced a revolutionary new system of governing both nomadic and sedentary populations simultaneously. His concept was to divide the empire into two sections called Chancelleries. The Northern Chancellery (北院) consisted of nomadic steppe peoples, including the Khitan and conquered steppe tribes. The Southern Chancellery, by contrast, included territories incorporated into Khitan domains that was populated by Chinese and the people of Balhae. The Northern Chancellery was run on a steppe military model. Abaoji was known as the Great Khan of the Northern Chancellery. The entire steppe population was constantly mobilized, ready for military action should it be required. The Khitan language, for which scripts were devised in 920 and 925, was the official language of the Northern Chancellery. The Xiao family, the consort family to the new imperial family, would govern the North. The Southern Chancellery (南院) was run on a civil model. Here Abaoji served as an emperor more in line with the Chinese model of leadership. The vast majority of the administrative work was done by the sedentary populations themselves under the leadership of Abaoji’s family, who at some point adopted the surname Yelü. Chinese was the official administrative language of the region. The Southern Chancellery even adopted the Tang practice of competitive civil service examinations to staff the various bureaucracies of government required to govern a large sedentary population. However, due to suspicions over this overtly Chinese system, initially small numbers of jinshi degree holders were actually appointed to government posts. Loyalty, a holdover of common steppe practices, was still a more important means of appointment, even in the Southern Chancellery. Despite the brilliance of this administrative innovation, it most certainly did not meet with universal approval from the Khitan elite. They believed, with some justification, that the development of a Chinese-style imperial system would seriously harm their interests within Khitan society. Thus, many elite, including those in Abaoji’s own family, rebelled against his rule. This persisted for nine years. In 916, Abaoji began his attempt to institute another stabilizing innovation, borrowing the Chinese notion of primogeniture. He named his eldest son, Prince Bei, heir apparent, a first in the history of the Khitan. However, despite Abaoji’s support for this system, it never really took hold until the end of the tenth century. In 918, the government occupied a newly constructed walled-city that would serve as the Liao capital. Called Shangjing 上京 (Supreme Capital), it not only served as the administrative center of the new empire, it also included a commercial district called the Chinese city 漢城 (Hancheng – not to be confused by the former Chinese name for Seoul which was the same). The city was built on a site hallowed by the Khitan people at the headwaters of the Shira Muren River. More than thirty walled cities were built, including four additional capitals that served as subsidiary capitals for the four other regions of the empire. An Eastern Capital was built near present-day Liaoyang . After the Sixteen Prefectures were absorbed into the empire, a Western Capital was built near Datong while the Southern Capital was constructed on the site of present-day Beijing. There was also a Central Capital. These cities were not only capitals of their respective regions, they also served as centers of commerce, and provided considerable wealth for the Liao Dynasty. Abaoji had named his eldest son, Prince Bei, heir apparent in 918. However, his widow, Empress Dowager Yingtian, was more of a traditionalist than her husband. Thus, she did not so readily accept the notion of primogeniture. She believed that her second son, Deguang, would have made a more appropriate Khitan emperor because he displayed the traditional traits deemed appropriate to steppe leadership. He was declared the successor to Abaoji while Prince Bei retained his title. Prince Bei later went to China, where he was assassinated in 936. Succession issues were not solved upon Deguang’s death in 947. Empress Dowager Yingtian, favoring her third son, immediately denounced her grandson, who was in line to become the third Liao emperor. However, Prince Lihu was seen by all as being wholly inappropriate to be the leader of the Khitan. Civil war loomed, but did not materialize as the court failed to support Yingtian on this occasion. Her grandson became emperor Shizong. Succession did not return to Prince Bei’s line, as intended by Abaoji in 918, until 969 with the death of Muzong and the accession of Yelu Longxu as Emperor Jingzong. Succession would remain in this line until the fall of the Liao Dynasty in 1125. Despite this misleading stability, there were still numerous succession challenges to the end of the dynasty. Law in the Liao Dynasty was applied differently in the Northern and Southern Chancelleries. The Northern Chancellery, governed by the Xiao consort clan, retained a distinctive Khitan-steppe character. The level of sinification of the Khitan people has been debated. While it is clear that the ruling Yelu clan had been sinified to some extent, the bulk of the Khitan people seems to have resisted Chinese acculturation. The above resistance to the idea of primogeniture among the Khitan elite is only one indication of a resistance to Chinese acculturation. However, physical similarities aside, the cultural assimilation is clearly noted by the fact that Russian people who had established contact with the Khitan people, had in fact believed they've established contact with the Chinese people, and the name for "China" in the Russian language has always been "Китай", which is pronounced "kitan". One of the stated purposes of the division of the empire between a Northern Chancellery and a Southern Chancellery is to create different forms of government for the steppe peoples in the north, which maintained steppe norms of society and government, and for the sedentary peoples in the south, which used mostly Chinese methods of governance. Abaoji, who himself spoke Chinese and was familiar with Chinese culture, did not speak Chinese in front of his subjects. He revealed to Later Tang Dynasty envoy Yao Kun before his own death that he did not wish the Khitan people to lose the edge that they enjoyed as a nomadic people. He did not want them to become “soft” like the Chinese. Another indication of resistance to acculturation is the Chinese notion of the use of surnames, a notion of which is a measure in the minimization of potential incestuous contacts. For a century and a half under the Yaolian clan, only the imperial clan used a surname. Only after Abaoji ascended to the position of Great Khan, did his clan as well as the Xiao consort clan adopt surnames, though the exact time is a matter of some debate. It may have taken place either before or after Abaoji's death. The issue arose again in 1074 when a proposal to have all Khitan use surnames was refused by the emperor as being too Chinese. It was believed that it was result in a radical reordering in Khitan society seen as undesirable . Women in the steppe societies typically had a greater range of rights and responsibilities than they had in the sedentary societies to the south. Upper class women were free to remarry after the death of their husbands. Empresses were genuinely regarded as co-rulers with their husbands. They were also included in the religious and ritual life of society.However, with these increased rights also came responsibilities. Women likely had to bear more of the hard work to maintain daily life as the men were often out hunting or preparing for war. They were competent in many forms of labor and had to cope with hardship in a way their sedentary counterparts were not exposed to. The traditional practice of being required to marry the husband of one's elder sister when she died was ended by imperial decree in 940, though it was not outlawed. The Khitan were initially an illiterate society. In 920, Abaoji ordered the creation of a script that came to be known as the Khitan large-script. While it apparently incorporated elements of Chinese writing, the two are not mutually intelligible and still has not been deciphered to this day by linguists. In 925, the appearance of an Uyghur envoy to Liao spurred the call to create a new script based on the alphabetic principles of the Uyghur script. This Khitan small-script was simpler to use than the previous one. It has been partially deciphered by linguistic experts, and it is hoped recent discoveries near Datong will aid in its being completely deciphered. Chinese writing was used in the administration of the Southern Chancellery, but its use was restricted to the Khitan elite. Abaoji and subsequent emperors of Liao did not allow widespread use of Chinese for fear that it would result in excessive cultural compromise. It was also feared that it would strengthen any Chinese dissent towards Liao-Khitan hegemony while the Northern Song Dynasty to the south was still a considerable foe. Though the founding emperor Abaoji ordered the construction of Buddhist, Confucian, and Taoist temples, successive emperors embraced Buddhism. A noticeable increase in devotion to Buddhism can be traced to the reign of Emperor Shengzong. Within a century, local government offices report that there 360,000 monks and nuns in 1078, representing about ten percent of the population. Even if exaggerated, it is clear that Buddhism was an integral part of Liao life. Some use the adoption of Buddhism as additional evidence to argue for sinification, however, the Khitan seem to have regarded Buddhism as a non-Chinese religion as they realized that the Uyghurs practiced it as well. The Liao were more committed to Buddhist studies than their Song neighbors. A complete edition of the Tripitaka about 1075 with a print quality that far exceeds that of its Song contemporaries. This was used by the Koreans to produce their own version of the Tripitaka by 1082. Still, most Khitan still adhered to an animistic religion where the sun was worshiped. Thus, the emperor faced the east, where the sun rises, rather than the south as Chinese emperors did. Because the Khitan gave ritual priority to the left, the north was given priority to the south. From the rise of Abaoji to the fall of the Liao Dynasty in 1125, a total of six dynasties ruled northern China . First were the Five Dynasties, which ruled northern China in succession from 907 to 960. Then, there was the Song Dynasty, which succeeded the Later Zhou Dynasty in 960, and which within two decades, was able to incorporate the southern kingdoms into its realm, unifying nearly all of traditional Chinese lands. The Later Tang Dynasty was founded by the Shatuo Turks in 923 after its founder, Li Cunxu, the son of Abaoji’s blood brother Li Keyong, had overthrown the Later Liang Dynasty. However, relations between the two were deteriorating, largely because of Khitan incursions into Hebei , taking booty and captives. Li Cunxu had died in 926. Despite the general deterioration in relations, the Later Tang Dynasty sent an envoy by the name of Yao Kun to the Liao Dynasty. When he arrived, however, Abaoji was on campaign, completing the conquest of the sedentary kingdom of Balhae (known in Chinese annals as Bohai.) Abaoji’s appetite for expansion had apparently not been sated by the conquest of Balhae, because he sent a demand for cession of the Sixteen Prefectures, which made up the border region between the two empires. However, Abaoji died on September 6, temporarily removing attention from the Sixteen Prefectures. The Later Tang Dynasty weakened in the 930s. When Shi Jingtang revolted, the Liao sent a large army through the passes at Shanxi to assist. In return for assistance in his revolt, the new Later Jin Dynasty, Shi ceded the Sixteen Prefectures to the Liao. Han Chinese and Shatuo Turks living in Later Jin territories chafed at the subordinate position they had in relation to the Liao. This led the Later Jin court to begin to display independence from the Liao. Consequently, the Khitan attacked as far as Kaifeng , where they stole maps archives, water clocks, musical instruments, and copies of the Classics, and kidnapped craftsmen and scholars. They then decided to move further into the present day provinces of Hebei and Shanxi . However, faced with the difficulties of governing a large sedentary population, the Liao emperor changed his mind about being emperor of China and decided to return to the Southern Capital. On the return in 947, the emperor died. These events led to the collapse of the Later Jin Dynasty, and with the power vacuum left when the Liao emperor’s death, the short-lived Later Han Dynasty was founded. The Later Zhou Dynasty struck at Liao positions in 958 in an attempt to regain the Sixteen Prefectures. After successfully taking two prefectures in Hebei , Emperor Muzong sprung into action, leading a Khitan cavalry force to the Southern Capital the following year. Military confrontation was averted with the death of the Later Zhou emperor. The Liao invaded the Song Dynasty in 1004, and stopped just north of Shanyuan, about 100 miles (160 kilometers) north of the Song capital of Kaifeng . The Song emperor Zhenzong met them with a force. The Treaty of Shanyuan was worked out in January, 1005. The Song Dynasty was required to pay an annual tribute to the Liao. The treaty also stipulated that the two imperial families address one another using familial terms. The tribute was increased and extended to Xi Xia when the Liao and Tanguts threatened further invasion in 1042. In 1018, General Xiao Baiya of Liao invaded Goryeo with 100,000 men. This time, many officials urged to king to enter a peace negotiation, since the damage from the 2nd Koryo-Khitan War was so great and Goryeo was not able to recover from the damage. However Gang again urged the king to fight the Khitans, since the Khitan force was much smaller than the previous invasions. Gang volunteered to be deputy commander-in-chief of the Goryeo army, at the age of 71. He led about 200,000 men toward the Goryeo-Liao border. The first battle of the war was the Battle of Heunghwajin, which was won by General Gang by blocking a stream and then destroying the dam when the Khitans were mid-way through crossing. Many Khitans drowned, but General Xiao did not give up hope of capturing the capital, Gaeseong , and continued to march southward. Later Xiao realized that the mission was impossible to achieve, and decided to retreat. General Gang knew that the Khitan army would withdraw from the war, and waited for them at the fortress of Kwiju, where he encountered retreating Khitans in 1019. (Battle of Kwiju). Discouraged and starving, the Khitans lost in a battle there. Following his victories in Third Goryeo-Khitan War, peace was made. From the time of the empire's creation all the way to its decline, the Liao Dynasty was recognized by Korea . Russian people in their first contacts with Khitan people of Liao, had believed that they had in fact established contact with the empire of China, whom were culturally and physically similar to the Chinese, and henceforth, the country-name of China in Russian, is called Китай (pronounced kitan). The Khitan were also in contact the Abassid empire, and the court of Baghdad once asked for a Khitan princess for marriage. These relations established the Khitans all across the steppes, before the Mongol expansion. Commercial activity allowed the Khitans to make their name known beyond the Pamirs and in Europe. After the fall of the empire, a part of the Khitan nobility led by Yelü Dashi emigrated to the Uyghurs of Xinjiang, and with their help created the Kingdom of Karakhitan. This was a Turko-Mongol kingdom that was very sinicized. The kingdom allowed Buddhism and Nestorian Christianity to flourish. Its capital was at Balasaghun , south of Lake Balkhash and extended to the areas of Kashgar and Samarkand . The kingdom enjoyed a victory over the Seljuk Turks near Samarkand in 1141 and remained stable until it was destroyed by Genghis Khan in 1218.